Over the coming months I’ll be basing a number of blog posts, including this one, on material from my forthcoming book, The Shady Lady’s Guide to Northeast Shade Gardening. The official publication date is May 6, 2014. You can learn more about the book here, here and here. In my last blog post I talked about a process of elimination I think gardeners should use in order to choose perennial plants for their gardens and why I believe that process will result in the best choices. The rationale behind it can be boiled down to a few simple words: plants are not created equal—at least not from an ornamental gardening standpoint. Some are much better garden performers than others. 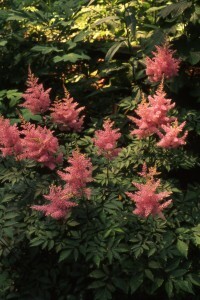 Astilbe is an excellent example of a backbone plant: it looks good all season and doesn't require tons of work. The basic lesson for gardeners to learn from the process I outlined last time is this: there are a finite number of plants that will grow and perform well in any given set of garden conditions. The restrictions that the climate, the property, and the gardener’s needs and preferences place on candidate plants amount to a list of demands; the longer that list, the fewer the number of plants that can fit the bill. By making too many demands, it is possible to hone the list of prospective plants down to zero. It’s also important to realize that there’s no such thing as an ideal plant. You should no more expect perfection from a plant than a person, so you may have to give a little when it comes to your preferences. Looking back at all the questions I said you should ask yourself when considering plants for your garden, I want to be clear that I’m not telling you there’s any plant for which all the answers will be what you want them to be. I’m just saying that for some plants a lot more of those questions have good answers, and those are the ones you should use to fill most of the space in your shade garden. In fact, I have a name for these superior garden candidates: “backbone” plants. These are ornamentals whose exceptional qualities make them the best choices for filling the majority of the space in your garden. If you use them in abundance, they’ll hold your garden together and keep it solid, like a spine supports a body. Everything else, to one degree or another, is filler. Strive to use backbone plants for at least 75-80% of your garden. Actually, you could build your garden from nothing but backbone plants, but for the sake of variety, you may allocate 15-20% of the space to secondary, filler plants that I refer to as “accent” plants. Finally, you can devote 5-10% of the space to a few annuals or tender perennials if you really feel the need to have them. Old-fashioned bleeding heart is certainly a pretty face, but without staying power it doesn't qualify as a backbone plant. Don’t include either bulbs or spring ephemerals in any of these categories. 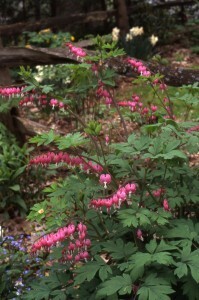 Bulbs and spring ephemerals are one-season plants (although a few, like the old-fashioned bleeding heart pictured here, will stick around until August). Although you do have to be careful how you position them, you shouldn’t think of them as occupying any percentage of garden space. When designing your garden, fit spring ephemerals and bulbs in between the long-season perennials so that when they go dormant they do not leave noticeable gaps. Alternatively, put them in areas where annuals will be planted when the weather warms. So, what are some examples of backbone plants? I’ll give you two examples of backbone shade plants here, although this process of categorizing plants by their ability (or not) to deliver long-season performance applies equally well to sun as to shade. shade, flowering will be minimal. White wood aster is an underappreciated but very fine native backbone plant. 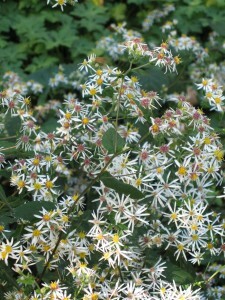 Among the native plants, white wood aster is a backbone plant that may be unfamiliar to most gardeners. It’s a common roadside plant that’s also lovely in garden settings. As is typical for members of the aster tribe, it starts flowering in August or early September. Its foliage is solidly disease-free, while its medium-green leaves contrast subtly with mahogany stems. It’s a bit of a spreader, but no more so than many exotic perennials, so I don’t consider that a real detraction. In some areas, I have seen deer browse white wood aster, but most of the time they leave it alone. Plants like astilbe and white wood aster are reliable and unfussy—like friends who are easy to be with and always come through in a pinch. But you’ll notice that neither one gets “perfect marks.” As I pointed out earlier, it will almost never be the case that a plant perfectly suits all your needs and desires. And they are not no-maintenance plants—there is no such thing in a garden setting. Each one has a rather predictable growth habit or behavior that will eventually demand your attention—astilbes often want division every few years, while white wood aster will migrate and have to be kept in bounds—but neither one will require an onerous amount of work. What they offer is a high likelihood of being successful additions to your garden, delivering steady results through the years while not making you regret ever planting them. I know that this way of thinking about plants and plant selection may seem novel or even backwards to many readers. Gardeners are inundated with the message that gardening is all about personalizing your space and expressing your taste, not to mention the message that it should be cheap and easy, to boot (it generally isn’t, but that’s a topic for another blog post). While it’s certainly true that your garden should reflect your individuality, focusing too much on that obscures some inconvenient facts. Successful gardening means finding a manageable way to get good results given your budget of time and money, and for most homeowners that means putting functionality first. I hope I’ve persuaded you of the value of using my approach. If you need a little more convincing, consider this: in the early years of my ornamental gardening experimentation, I bought a lot of plants I liked a lot and proceeded to…kill them. Mostly—because I was trying to determine the limits of their shade tolerance—I subjected them to inadequate light, and of course, a lot of them expired. I feel kind of guilty about it now, but all that “horticide” did have a point: those sacrificial plants eventually taught me to categorize a wide range of shade perennials by both their needs and their performance potential for gardeners. In the process, I came to appreciate a whole new palette of plants for their ability to tough out the difficult conditions we Northeast shade gardeners face. 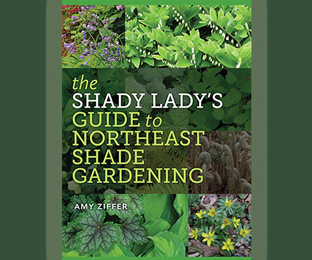 In my upcoming book, The Shady Lady’s Guide to Northeast Shade Gardening, I elaborate on the topic of what makes a superior shade garden perennial and how to use a wide range of shade plants to good effect. I hope that knowledge will help you find the best choices for your particular situation.